Cattleyas are among the most beautiful of orchid flowers. 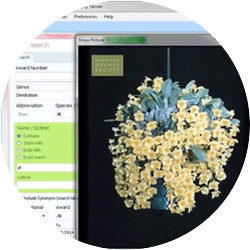 Often used in corsages and wedding bouquets their blooms can last several weeks to a month or more. Miniature cattleyas have increased in popularity because of their ease in growing on windowsills in the home. Cattleyas store water in both their psuedobulbs and their roots. Miniature catts and seedlings need more frequent watering than the larger standard Catts because they store less water. Potted in a bark mix (finer bark for the smaller catts and seedlings) the mix should be allowed to dry out before re-watering. Summer months and active growth periods will require more frequent watering. After a few watering, you will be able to tell by the weight of the pot whether or not it is time to water again. If in doubt, wait a day. Generally, watering once a week to ten days is sufficient for large cattleyas; seedlings and miniatures need water every five to seven days. 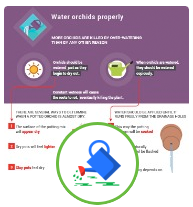 When watering, place the plant in the sink and use tepid water. Do not use salt-softened or distilled water. Let the water run through the plant for a minute or so. Be sure to let the plant drain completely. This is a good time to look closely at your plant for any sign of insects or disease. 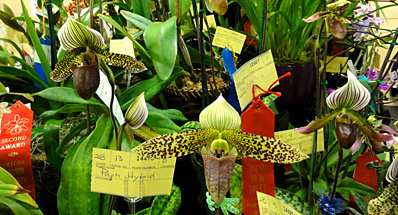 Catts belong to the ‘high’ light group of orchids. The bright light of an east or west window is ideal; south windows can also be used if shaded with a sheer curtain. The leaves should be medium green. If your plant is not blooming for you try increasing the light. 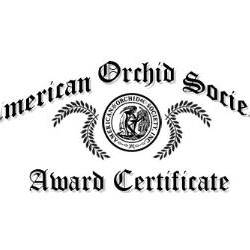 Without sufficient light a cattleya will not bloom. Catts generally enjoy warm temperatures; ideally, 55-60F at night and 70-85F during the day. Mature plants do well with a 15-20 degree difference in day and night temperatures. Keep in mind that temperatures close to the window on a windowsill will be colder or hotter than your general house temperature. 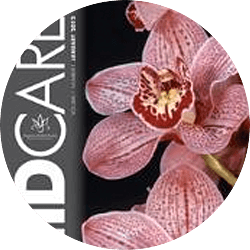 Any balanced orchid fertilizer (look at the numbers on the container, 20-20-20, etc.) 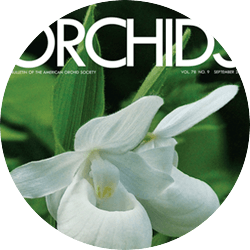 can be used to fertilize your orchid. Feed weakly (¼ strength) weekly works well for catts. Once a month use clear water to flush any accumulated salts from the potting mix. Increase the fertilizer to ½ strength when the plants are in active growth. Use a shallow tray of pebbles filled with water to increase humidity around your plants. Be sure the pot does not sit in water as this will rot the roots. 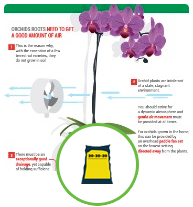 Give your plants room for air to circulate around them. Crowding of plants can lead to problems with insect infestations and fungus. 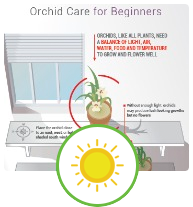 A small fan will help provide good air circulation around your plants. When the blooms are finished, remove them from the plant. Continue watering and fertilizing and within a year it will begin the blooming cycle again! Cattleyas should generally be repotted every two to three years either after flowering or in the spring.